Airman 1st Class Carl Jerome Ware Jr. 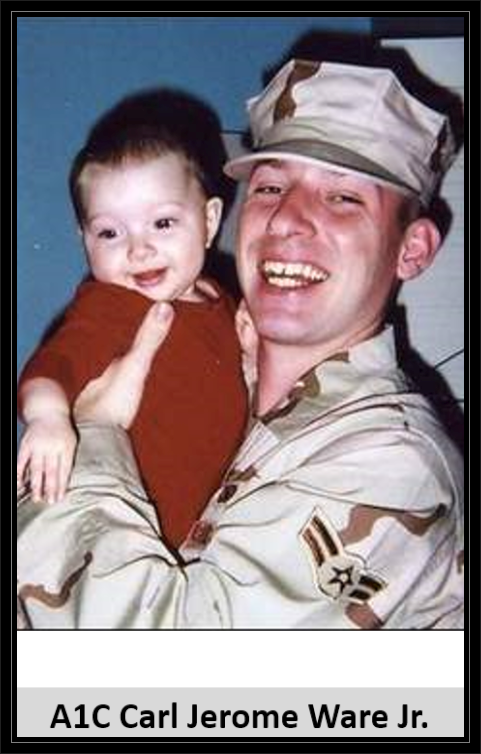 Hometown: Glassboro, New Jersey, U.S.
Died: July 1, 2006 in Operation Iraqi Freedom. Unit: Air Force, 15th Security Forces Squadron, Hickam Air Force Base, HI. 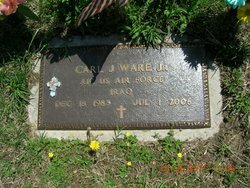 U.S. Air Force Airman 1st Class (A1C) Carl Jerome Ware Jr., 22, of Glassboro N.J., died July 1, 2006, at Camp Bucca, Iraq, in a non-combat-related shooting. Camp Bucca is a military base in Southern Iraq that serves as an internment center for captured insurgents. He was a military security officer, based out of Hickham Air Force Base near Honolulu, Hawaii. Carl was born on December 18, 1983, in Pennsylvania to Carl Sr and Rosalie “Rose” Ware, who also have a daughter, Angela “Annie” Ware. His legal guardians were David and Barbara Stutzbach of Glassboro, New Jersey. Carl lived with the Stutzbachs after the Ware family moved to California in 1998. The Stutzbach’s sons David and Ryan were like brothers to him. Carl graduated in 2002 from Smyrna High School, Smyrna, Delaware. Carl married Christine “Chrissie” Marie Lynch of Glassboro, New Jersey, in January of 2003, at Waikiki Beach, following Chrissie’s completion of Air Force basic military training. (Chrissie has since left the Service.) Carl enlisted in the Air Force almost one year later, in February 2004. Carl and Chrissie had been together since they were 14 years old. Their first daughter, Caitlyn, was born in July 2005. Before deploying, Carl taught Caitlyn how to speak on the phone so he could talk to her while serving his country in Iraq. The couple’s second daughter, Carly, was born in January 2007, following Carl’s death. 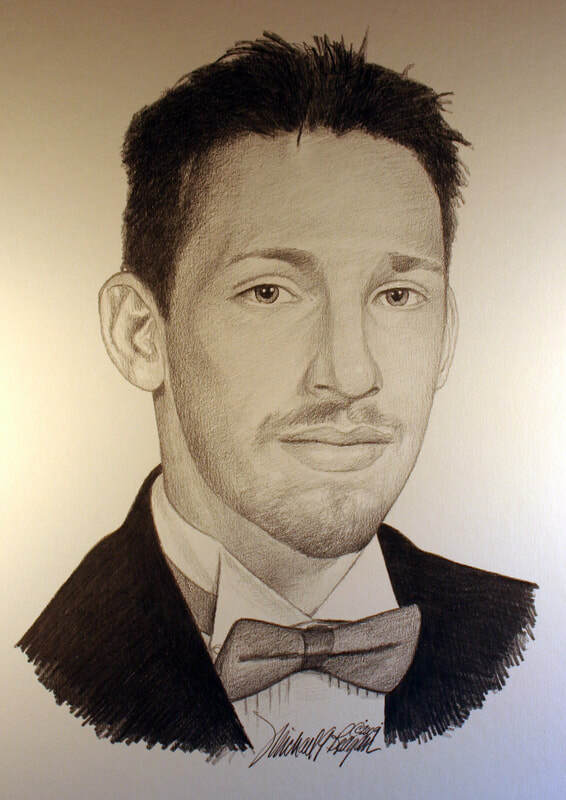 Carl is remembered for his sense of humor and ability to put others at ease. He enjoyed poker, golf, road trips, and working on his Firebird. Most of all, he loved his job and his family. Family members said they’ll remember the young soldier as a caring, principled man. His funeral service, with full Military Honors, was held on Friday, July 7, 2006, and Carl is buried at Manahath Cemetery in Glassboro, New Jersey.